The missing key, a 4 euro fix. Not a month goes by without at least a minor change in my synth setup. Yesterday I sold my beloved Korg Dw-8000 to a new enthusiastic owner and it’s place was instantly filled with a beautiful Roland JX3P. I even managed to make small profit in the process. I originally found the DW-8000 in a recycling center for a hundred euros (actually it cost only 80 euros, because I cunningly used my girlfriend’s student discount card). It was in quite a bad shape at the time, with missing screws, a fucked-up power connector and most importantly the memory battery needed changing. I gave the synth my usual TLC+CRC -treatment, replaced a couple of parts with new ones and gave it a new lease of life. Yesterday I sold it for 260 euros and bought the JX3P for 300. It’s a peculiar feeling when there’s a new synth in the house. You try to do your work, read the paper, watch tv or wash the dishes, but every once in a while you have to turn the new synth on, fiddle with the knobs, program a new sound or just play a couple of licks. Then turn it off again and return to whatever you were doing before. You can’t really keep your hands away from the keys and the same tingling feeling kept me awake this morning when I tried to sleep a little longer. The beauty of JX3p, besides it’s sporty good looks, compared to other Roland/Korg synths from the same period is that it has a 16step step sequencer built in. I love the arpeggiator in all it’s different disguises as much as the next nerd, but you can’t really write songs with an arpeggiator. It’s a little too arbitrary. With a sequencer you can program exactly the notes you want in exactly the order you wish and even have notes with different lengths. I instantly programmed some italo-style basslines and then played a melody on top in the upper register. Just lovely. On top of that, the sequencer can be synced to an external trigger-signal so I can get my basslines in sync with the aforementioned arpeggios. Beautiful! After a few minutes of furious fiddling, the sound programming also started to make sense. There’s no display in JX3P and I had doubts on the functionality of sound programming without any visual feedback, but the ingenious Roland engineers from 1983 have decided to use all the leds on the unit to display edit-data. Surprisingly it works and looks cool too. As the DW-8000 was in a little rough shape when I got it, so is the JX3P too. The highest C is not playable as it scratches against the metal case and gets stuck. 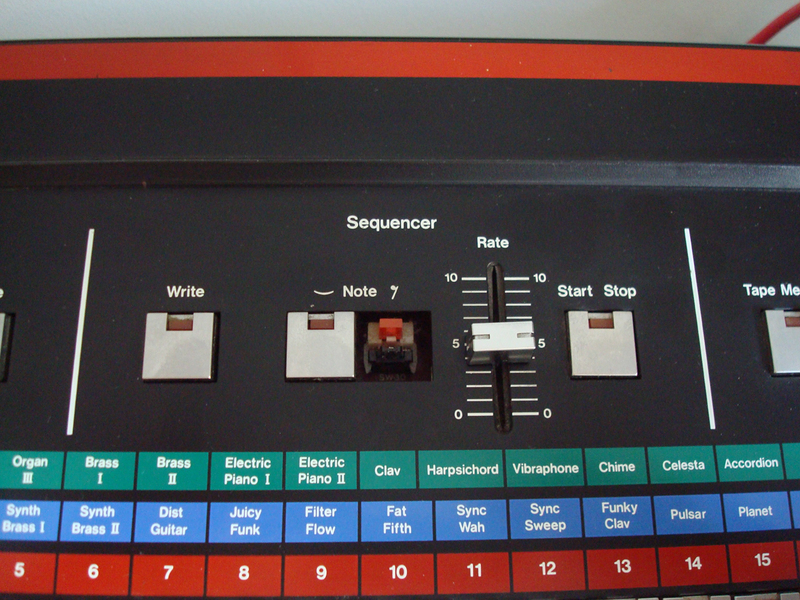 The synth is missing one of the sequencer buttons too. I already checked, and you can order those silvery buttons for the price of $3,95 each. I’ll order two or three just to be on the sure side. And some of my other synths could use a few spare parts too, I’ll order those too. The stuck c-key seems also to be a quite easy fix. I wish I only had the time to open the synth and do my magic. Maybe I’ll wait for the spare parts to arrive first. One of the many sympathetic things about this synth is the way it says “Enverope” on top of the ADSR-charts painted on the synth’s metallic top surface. Supplies, supplies!!! Do you have plans to upgrade the JX3P? Or do you own / are you getting a PG-200 Controller? Upgrading, bending or otherwise altering the original circuits in any way is strictly against my religion. Would love to have a PG-200 though. And while we’re at it a PG-800 would be good too.